This article is about the mechanical game popular in Japan. For the novel by Min Jin Lee, see Pachinko (novel). Pachinko parlors are widespread in Japan, and they usually also feature a number of slot machines (called pachislo or pachislots); hence, these venues operate and look similar to casinos. Modern pachinko machines are highly customizable. Gambling for cash is illegal in Japan. Pachinko balls won from games cannot be exchanged directly for money in the parlor. The balls also may not be removed from the premises, and are engraved in identifiable patterns showing to which parlor they belong. Balls won at the parlor are exchanged for prizes or tokens, which can be exchanged for cash at a place nominally separate from the parlor. One prize exchange may serve a number of nearby parlors, getting a percentage of the prize's value when it is collected by the parlor. A pachinko machine resembles a vertical pinball machine, but is different from Western pinball in several ways. 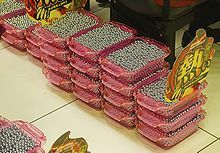 First, a pachinko machine uses small (11 mm diameter) steel balls, which are rented to the player by the owner (usually a "pachinko parlor," featuring many individual games in rows), while pinball games use a larger, captive ball. The pachinko balls are not only the active object, but are also the bet and the prize. The player loads one or more balls into the machine, then presses and releases a spring-loaded handle, which is attached to a padded hammer inside the machine, thus launching the ball into a metal track. The track guides the ball around the edge of the playing field, then when the ball loses momentum, it falls into the playing field from near the top. Some pachinko machines have a bumper to bounce the ball as it reaches the top, while other machines allow the ball to travel all the way around the field, to fall on the second time that it reaches the top. In either case, the ball enters the playing field, which is populated by a large number of brass pins, several small cups into which the player hopes the ball will fall (each catcher is barely the width of the ball), and a hole at the bottom into which the ball will fall if it doesn't enter a catcher. The ball bounces from pin to pin, both slowing the fall and making it travel laterally across the field. A ball which enters a catcher will trigger a payout, in which a number of balls are dropped into a tray at the front of the machine. 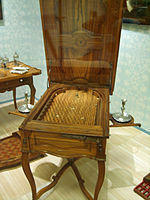 Many games made since the 1960s feature "tulip" catchers, which have small flippers which open to expand the width of the catcher. Tulip catchers are controlled by the machine, and may open and close randomly or in a pattern; an expert player might try to launch the ball with an impulse and timing to reach the catcher when the flippers are open. The object of the game is to capture as many balls as possible. These balls can then be exchanged for prizes. Pachinko machines were originally strictly mechanical, but modern ones have incorporated extensive electronics, becoming similar to video slot machines. 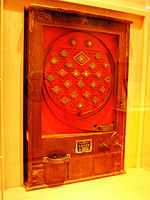 Pachinko machines were first built during the 1920s as a children's toy called the "Corinth game" (コリントゲーム, korinto gēmu), based on and named after the American "Corinthian bagatelle". Another likely inspiration was the Billard japonais, 'Japanese billiards', invented in Western Europe during the 18th century. It emerged as an adult pastime in Nagoya around 1930 and spread from there. All of Japan's pachinko parlors were closed down during World War II but re-emerged in the late 1940s. Pachinko has remained popular since; the first commercial parlor was opened in Nagoya in 1948. 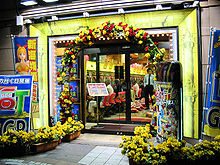 As a country influenced by Japan during its occupation, Taiwan has many pachinko establishments. Nowadays an estimated 80 percent of pachinko parlors in Japan are owned by ethnic Koreans. Until the 1980s, pachinko machines were mechanical devices, using bells to indicate different states of the machine. Electricity was used only to flash lights and to indicate problems, such as a machine emptied of its balls. Balls were launched using a flipper; their speed was controlled by pulling the flipper down to different levels. Manufacturers in this period included Nishijin and Sankyo; most of these machines available on online auction sites today date to the 1970s. After that time, pachinko machines incorporated more electronic features, thus requiring electricity for operation. Billard japonais, Southern Germany/Alsace ca. 1750–70. Mechanical pachinko machine from the 1970s. A modern, electronic pachinko machine in a Tokyo parlor. To play pachinko, players get a number of metal balls by inserting cash or cards directly into the machine they want to use. These balls are then shot into the machine usually via pulling a lever once for each launch from a ball tray. The balls then fall vertically through an array of pins, levers, cups, traps and various obstacles until they reach the bottom of the machine screen. The player has a chance to get more balls to play with if one of the launched balls hits a certain place during the fall through the Pachinko machine. Having more balls is considered a benefit, because it allows the player to remain in the game longer and ultimately have a larger winning chance. Newer machines have a digital slot machine on a large screen in the center of the system. The objective of this part is to get 3 numbers or symbols in a row for a jackpot. Older pachinko machines had a spring-loaded lever for shooting the balls individually, but newer ones use a round knob that controls the strength of an electrically fired plunger that shoots the balls onto the playing field. When shot, the balls drop through an array of pins; some of them will fall into the centre gate and start up the slot machine in the centre screen. Every ball that goes into the centre gate results in one spin of the slot machine, but there is a limit on the number of spins at one time because of the possibility of balls passing through the centre gate while a spin is still in progress. Each spin pays out a small number of balls, but the objective is to hit the jackpot. The program of the digital slot machine decides the outcome of the spin when the ball falls through the center gate, not when the spinning animation plays. The inside workings of a pachinko machine being pulled out of a parlor. If the first 2 numbers or letters of the spin match up, the digital program will display many animations before the third reel stops spinning, to give the player added excitement. This is called a reach (or reachi) and sometimes longer animations are played called super reaches. Pachinko machines offer different odds in hitting a jackpot; if the player manages to obtain a jackpot the machine will enter into payout mode. The payout mode lasts for a number of rounds. During each round, amidst more animations and movies playing on the centre screen, a large payout gate opens up at the bottom of the machine layout and the player must try to shoot balls into it. Each ball that successfully enters into this gate results in a large number of balls being dropped into a separate tray at the bottom of the machine, which can then be placed into a ball bucket. To enhance gameplay, modern machines have integrated several aspects not possible in vintage machines. One commonly used addition is the ability to change between different play modes, including rare and hidden modes that can differ significantly from normal play. Two examples can be seen in the Evangelion series of pachinko machines, which include mission mode and berserker mode, which range from having little effect on winning to being an almost guaranteed win. The videos played and light patterns can also give players a general idea of what their odds of winning are. For example, a super reach might make a small change in its animation or show an introductory animation or picture. This adds excitement to playing as any given machine will have several common patterns or animations that can occur, with some having much more significance than others in terms of ultimate odds of winning on a given spin. Some machines even allow for instant wins or second-chance wins in which a spin that appears to have lost or have very low chance of winning based on the hints shown will award the player with three matching numbers and enter into fever mode without necessarily matching numbers up during the reach or spin. After the payout mode has ended, the pachinko machine may do one of two things. Most Pachinko machines employ the kakuhen (確変, short for 確率変動 meaning probability change) system, where some percentage of the possible jackpots on the digital slot machine result in the odds of hitting the next jackpot multiplying by a large amount, followed by another spin regardless of the outcome. The probability of a kakuhen occurring is determined by a random number generator. Hence, under this system, it is possible for a player to get a string of consecutive jackpots after the first "hard earned" one, commonly referred to as "fever mode". Another type of kakuhen system is the special time or ST kakuhen. With these machines, every jackpot earned results in a kakuhen, but in order to earn a payout beyond the first jackpot, the player must hit a certain set of odds within a given amount of spins. When a jackpot does not result in a kakuhen combination, the pachinko machine will enter into jitan (時短, short for 時間短縮 meaning time-reduction) mode, with a much larger number of spins than kakuhen. Under the original payout odds, the center gate widens to make it considerably easier for balls to fall into it; this system is also present in kakuhen. To compensate for the increase in the number of spins, the digital slot machine produces the final outcomes of each spin faster. ST pachinko machines do not offer this mode; after it ends, the machine spins as in kakuhen. Once no more jackpots have been made, the pachinko machine reverts to its original setting. Starting in 2007, the majority of Japanese pachinko machines started to include koatari (小当たり, small jackpot) into their payout systems. Koatari is shorter than the normal jackpot and during payout mode the payout gate opens for a short time only, even if no balls go into it. The timing of the opening of the gates is unpredictable, effectively making it a jackpot where the player receives no payout. Koatari jackpots can result in a kakuhen as per normal operation, depending on the payout scheme of the machine in question. The main purpose of koatari is so that pachinko manufacturers can offer payout schemes that appear to be largely favorable to customers, without losing any long-term profit. In addition to being able to offer higher kakuhen percentages, koatari made it possible for manufacturers to design battle-type machines. Unlike old-fashioned pachinko machines that offer a full payout or a kakuhen for any type of jackpot earned, these machines require players to hit a kakuhen jackpot with a certain probability in order to get a full payout. This is orchestrated by the player entering into "battle", where the player, in accordance with the item that machine is based on, must "defeat" a certain enemy or foe in order to earn another kakuhen. If the player loses, it means that a normal koatari has been hit and the machine enters into jitan mode. Another reason for incorporating koataris is that they make it possible for a machine to go into kakuhen mode without the player's knowledge. This is referred to as senpuku (潜伏 'hidden') kakuhen because it does not occur in any of the jackpot modes. A player sitting at a used pachinko machine offering a 1 in x chance of hitting a jackpot in normal mode can hit it within x spins easily because the previous player did not realize that the machine was in senpuku. This induces players to keep playing their machines, even though they may still be in normal mode. 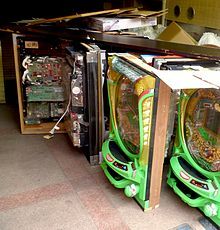 Japanese pachinko players have not shown significant signs of protest in response to the incorporation of koatari; on the contrary, battle-type pachinko machines have become a major part of most parlors. Pachinko machines vary in several aspects, including decoration, music, modes and gates. The majority of modern machines have an LCD screen centered over the main start pocket. The game is played with keeping the stream of balls to the left of the screen, but many models will have their optimized ball stream to be in the center of the play field or to switch from left side to right side depending on the game mode. Vintage machines vary in pocket location and strategy with the majority having a specific center piece that usually contains win pockets. Winnings take the form of additional balls, which players may either use to keep playing or exchange for prizes (景品 keihin). When players wish to exchange their winnings, they must call a parlor staff member by using a call button located at the top of their station. The staff member will then carry the player's balls to an automated counter to see how many balls they have. After recording the number of balls the player won and the number of the machine they used, the staff member will then give the player a voucher or card with the number of balls stored in it. The player then hands it in at the parlor's exchange center to get their prizes. Among the array of prizes available, there will invariably be an item known as the "special prize" (特殊景品 tokushu keihin: typically a small silver or gold novelty item encased in plastic) that can be sold for cash at an outside establishment in the vicinity of the parlor. Special prizes are awarded to the player in amounts corresponding to the number of balls won. For example, one special prize worth ¥1500 outside the parlor might be offered to a customer per 400 balls won, assuming each ball originally cost 4 yen. The vast majority of players opt for the maximum number of special prizes offered for their ball total, selecting other prizes only when they have a remaining total too small to receive a special prize. Besides the special prizes, prizes may be as simple as chocolate bars, pens or cigarette lighters, or as complicated as electronics, bicycles and other items. Under Japanese law, cash cannot be paid out directly for pachinko balls, but there is usually a small establishment located nearby, separate from the game parlor but sometimes in a separate unit as part of the same building, where players may sell special prizes for cash. This is tolerated by the police because the pachinko parlors that pay out goods and special prizes are nominally independent from the shops that buy back the special prizes. Some pachinko parlors may even give out vouchers for groceries at a nearby supermarket. The yakuza (organized crime) were formerly often involved in prize exchange, but a great deal of police effort beginning in the 1960s and ramping up in the 1990s has largely done away with their influence. In Tokyo, the special prize exchange is handled exclusively by the Tokyo Union Circulation [jp] company (known as TUC), which sells pachinko and slot parlors gold slivers in standardized plastic cases, which it buys back from winning customers at its "TUC Shop" windows. Many video arcades in Japan feature pachinko models from different times. They offer more playing time for a certain amount of money spent and have balls exchanged for game tokens, which can only be used to play other games in the establishment. As many of these arcades are smoke-free and the gambling is removed, this is popular for casual players, children, and those wanting to play in a more relaxed atmosphere. Thrifty gamblers may spend a small amount on a newly released model in such establishments to get the feel for the machine before going to a real parlor. The same machines can be found in many stores, with the difference being that they pay out capsules containing a prize coupon or store credit. Smoking is allowed in parlors, although there are discussions in Japan to extend public smoking bans to pachinko parlors. Gambling is illegal in Japan, but pachinko is regarded as an exception and treated as an amusement activity. Although awarding direct money prizes for pachinko is illegal, it is possible for parlors to reward players with golden tokens which can then be sold for cash at nearby exchange centers. With the growing public and political pressure in recent years, since passage of Japan's blanket anti-gambling law in the 1990s, the police are more active in regulating parlors. Retired officers often work in the pachinko parlor industry; critics have pointed out that while this has had a deterrent effect against organized crime involvement, it also means that these operators are in a strong position to influence police officers in their favor. The police tolerate the level of gambling in pachinko parlors. For example, in May 2005, a parlor in Kanagawa prefecture reported to the local police that someone had counterfeited their tokens and made off with the equivalent of US$60,000 in cash by trading them in at their nearby exchange center. Even with such information proving that this parlor was illegally operating an exchange center, which by law must be independent from the parlor, the police did not shut them both down, but instead only worked to track down the thief in question. Pachinko balls are forbidden to be removed from a parlor to be used elsewhere. To help prevent this, many parlors have a design or name engraved in each ball vended so that someone can be spotted carrying a tray of balls brought from the outside. This has led some to start collections of pachinko balls with various designs. 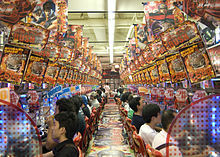 A number of media franchises, mainly Japanese media franchises (including Japanese film, anime, manga, television and video game franchises), have generated significant revenue from sales of licensed pachinko and pachislot machines to pachinko parlors and arcades. ^ Onimusha 3 pachislot machine sold 69,341 units in the fiscal year ended March 2005, and 51,097 units between April 2005 and March 2006. Onimusha: Dawn of Dreams pachislot machine sold 90,000 units. Pachislot Shin-Onimusha Sairin sold 41,060 units. Pachislot Onimusha3 Jikuu Tenshou sold 25,966 units. Pachinko Onimusha: Dawn of Dreams sold 33,000 units. ^ 77,378 units between September 2005 and March 2006. 116,000 between April 2013 and March 2018. ^ 30,245 pachinko units. 38,062 Spirit of Young Justice pachislot units. 125,000 other pachislot units. ^ Pachislot Monster Hunter sold 95,529 units. Other Monster Hunter pachislot machines sold 37,000 units. Pachinko CR Monster Hunter sold 32,430 units. Pachinko CR Monster Hunter 4 sold 15,055 units. ^ 136,000 sales up until 2014. 42,566 sales during January–March 2015. ^ 18,837 units between April 2006 and March 2007. 52,180 units between April 2007 and March 2008. 36,039 units between September 2010 and March 2011. 35,223 units between May 2011 and March 2012. 25,631 units between September 2012 and March 2013. ^ 48,723 Devil May Cry 3 units. 25,000 Devil May Cry 4 units. 15,000 Devil May Cry X units. ^ 60,089 sales during fiscal year between April 2004 to March 2005. 10,855 sales between April 2004 and March 2005. 10,010 sales in March 2015. ^ Kaze no Yojimbo sold 53,000 units. Kaze no Yojimbo 2 sold 23,464 units. ^ 29,000 Kaiji units. 18,235 Kaiji 2 units. 25,466 Kaiji 3 units. ^ 31,111 sales up until March 2013. 25,750 sales between May 2016 and March 2017. 8,127 sales during January–March 2018. ^ 39,000 units between October 2006 and March 2007/ 22,533 units between September 2010 and March 2011. ^ 37,132 Pachislot Tomorrow's Joe sales during January–March 2010. 16,364 Pachinko CR Tomorrow's Joe sales between July 2015 and March 2016. ^ 27,542 units between May 2007 and March 2008. 16,843 units between July 2009 and March 2010. ^ Sakigake!! Otokojuku sold 17,000 units. Pachislot Sakigake Otokojuku sold 24,318 units. ^ 10,453 units between September 2006 and March 2007. 21,097 units between August 2010 and March 2011. ^ 24,252 CR Ryu ga Gotoku Kenzan pachinko sales between December 2011 and March 2012. 4,759 Pachislot Ryu ga Gotoku OF THE END pachislot sales between November 2015 and March 2016. ^ 5,920 units in March 2009. 16,537 units between October 2011 and March 2012. ^ Schodt, Frederik (1996). Dreamland Japan: Writings on Modern Manga. Berkeley, CA: Stone Bridge Press. p. 111. ISBN 978-1-880656-23-5. ^ "Japanese Slot Game Generates More Revenue Than Las Vegas And Macau Combined". Fortune. 30 January 2017. ^ Reed, Daniel J. (2010). "How the Game Works". Dan's Pachinko Data Page. self-published. Retrieved 9 November 2009. ^ Reed, D. J. "A Little About the Machines". Dan's Pachinko Data Page. Retrieved 9 November 2009. ^ a b "Ball and chain: gambling's darker side". The Japan Times. 24 May 2014. According to Lee, an estimated 80 percent of pachinko parlors in Japan are currently owned by ethnic Koreans, 10 percent by Taiwanese and the rest by Japanese. Taiwan is the only country other than Japan where pachinko is popular, a fact often attributed to the legacy of Japanese colonialism. ^ a b "Modern vs Vintage Pachinko Machines". Vintagepachinko.com. Retrieved 9 November 2009. ^ Reed, D. J. "Electrical Notes". Dan's Pachinko Data Page. Retrieved 9 November 2009. ^ #60 Japanese PACHINKO MACHINE played byTodd Tuckey from TNT Amusements – WHY BOTHER???. 25 May 2012 – via YouTube. ^ Rick Slot. "Pachinko Machines, Japanese favorite recreational gambling". slotozilla.com. ^ Weasal Willington. "Pachinko Slot Machines – A Quick Review". 918Kiss.Review. ^ van custompachinko (17 February 2010). "Evangelion 4 pachinko 3 minute mission mode". YouTube. Retrieved 24 June 2014. ^ van custompachinko (25 February 2010). "Evangelion: The Beginning and the End – Rei mode". YouTube. Retrieved 24 June 2014. ^ van custompachinko (1 November 2010). "Ashita no Joe Rikishi Mode". YouTube. Retrieved 24 June 2014. ^ a b c d Plotz, David (4 November 2008). "Pachinko Nation". Japan Society, New York. Retrieved 9 November 2009. ^ Kushner, David (1 October 2010). "The Secret Life of Pachinko". IEEE Spectrum. Retrieved 2 October 2010. ^ "新流通システム". Toyoukyo.or.jp. Archived from the original on 19 December 2012. Retrieved 24 June 2014. ^ Shores, Trey (26 May 2006). "A dying breed: Japan's smokers are feeling the heat as the government slowly tackles tobacco". Metropolis. Archived from the original on 11 July 2006. Retrieved 12 September 2006. ^ Master, Farah (12 May 2014). "Taxing times for pachinko as Japan considers casino gamble". Reuters. Retrieved 24 June 2014. ^ "Fraud Investigation: Pachinko parlor" (PDF). ^ Graser, Marc (2 August 2013). "'Dark Knight' Producer Plays Pachinko to Launch Next Franchise (EXCLUSIVE)". Variety. ^ a b Beyond Expectations: Integrated Report (PDF). Sega Sammy Holdings. 2017. p. 73. ^ a b FY Ended March 2018: Appendix (PDF). Sega Sammy Holdings. 11 May 2018. p. 8. ^ FY Ending March 2019: 1st Quarter Appendix (PDF). Sega Sammy Holdings. 2 August 2018. p. 7. ^ a b c d e "Management Meeting" (PDF). Investor Relations. Sega Sammy Holdings. 30 November 2018. p. 6. Retrieved 1 April 2019. ^ a b Fact Book: Supplementary Financial Document for the Year Ended March 31, 2018 (PDF). Fields Corporation. 11 May 2018. p. 27. ^ a b c d e f FY2004 Financial Results (for the year ended March 31, 2005) (PDF). Sega Sammy Holdings. 25 May 2005. p. 9. ^ a b c d e FY Ending March 2006: Full Year Results Presentation (PDF). Sega Sammy Holdings. 16 May 2006. p. 9. ^ a b c d e f g h i j k l m n o p q r s t u v w Fact Book: Supplementary Financial Document for the Year Ended March 31, 2018 (PDF). Fields Corporation. 11 May 2018. pp. 20–21. ^ a b c d e FY Ended March 2013: Full Year Results Presentation (PDF). Sega Sammy Holdings. 13 May 2013. pp. 13–14. ^ a b c FY Ended March 2016: Full Year Results Presentation (PDF). Sega Sammy Holdings. 16 May 2016. pp. 13–14. ^ a b c d FY 2011: Full Year Results Presentation (PDF). Sega Sammy Holdings. 16 May 2011. pp. 15–16. ^ a b FY Ended March 2014: Full Year Results Presentation (PDF). Sega Sammy Holdings. 12 May 2014. pp. 13–14. ^ a b c FY Ended March 2017: Full Year Results Presentation (PDF). Sega Sammy Holdings. 15 May 2017. p. 13. ^ a b FY Ended March 2015: Full Year Results Presentation (PDF). Sega Sammy Holdings. 12 May 2015. pp. 12–13. ^ a b c d Fiscal Year Ended March 2007: Full Year Results (PDF). Sega Sammy Holdings. 14 May 2007. p. 9. ^ a b c d FY 2008: Full Year Results (PDF). Sega Sammy Holdings. 15 May 2008. p. 11. ^ a b c d FY Ended March 2012: Full Year Results Presentation (PDF). Sega Sammy Holdings. 14 May 2012. pp. 12–13. ^ "FY Ending March 2019 3rd Quarter Appendix" (PDF). Investor Relations. Sega Sammy Holdings. 5 February 2019. p. 7. Retrieved 1 April 2019. ^ a b c d Fiscal Year 2009: Full Year Results (PDF). Sega Sammy Holdings. 14 May 2009. pp. 11–12. ^ a b c Fiscal Year 2010: Full Year Earnings Presentation (PDF). Sega Sammy Holdings. 17 May 2010. pp. 11–12. Wikimedia Commons has media related to Pachinko.